Life is tough, but so are you! Learn how to work through life's trials with advice from popular youth speakers, including Hank Smith and Al Carraway, who have endured a few challenges of their own. This encouraging book will help you see trials as essential stepping-stones to becoming who you're destined to be. I was interested in this book because I have 5 kids and my oldest daughter is now a teenager. I love to have resources on hand where someone else besides Mom or Dad can share insight on life. Sometimes hearing it from someone else can make all the difference. Each of the authors contributing to this book provide fresh insight on the challenges that we all face in life. You'll read about the story of Joseph from the Bible and get a couple different perspectives on that. Hank Smith provided a detailed viewpoint of how Joseph might have felt and how his life would have been vastly changed had he not chosen to forgive and continue looking up. I loved that perspective! This book is a great read for teens and adults because the vignettes are short and easy to read in about five minutes. The lessons contained within aren't overly preachy--it's just great people sharing their own life experiences. Because we recently made a huge move the second chapter by Whitney Wilcox Laycock really resonated with me and my daughter. It was fantastic to read someone experiencing the very same feelings some of my kids have experienced from the move. Her story was inspiring and I loved the way she shared her simple testimony. This book would be excellent as a stocking stuffer for your teen or a pick-me-up when they are going through a rough patch. I encourage you to read it too! This book was written by members of The Church of Jesus Christ of Latter day Saints and I love how each author shares insight into the tough struggles that teens will face as part of growing up and how they really can say, "I've got this!" and be happy. I received a review copy of this book in exchange for my honest review. WOW! You have got to read this book! Whether life has you down right now or not this book is packed full of inspiration! LOVED EVERY WORD OF THIS BOOK! A MUST-READ FOR SURE! Amazing and inspiring nonfiction for teens! This book is amazing! I loved each one of the chapters in this book. It's written for teenagers, so it's really a quick read, I read the whole thing in less than an afternoon, but it's packed with great advice and spiritual lessons that teens need in this crazy world! This book is broken up into chapters by author. I loved each and every one of the authors and was amazed by the challenges that some of them have gone through. And the lessons they have learned are something that we can all learn from. I loved that directly after Whitney Wilcox Laycock's chapter there's one written by her dad, Brad Wilcox, that gives a little more definition to her chapter. This is a great book to have your teen read, but I can tell you right now that adults can learn from it as well, and that's a great thing! All of us human beings get down from time to time. The fact is life can be really hard and discouraging sometimes. Throw in adolescence and confusion often reigns supreme. That is where books like this one come into play. This compilation of stories and advice from those who've been there makes for an encouraging read as well as a strong reminder that bad times won't last and there is a way to pull it together and make it through. Trials related to loneliness, physical pain, football, and mistakes all come up in these stories. Stories of hope and faith, of ordinary individuals, and scriptural heroes, all of whom have had to learn to rely on God to help them conquer their tough times. I thought the two versions of the Joseph of Egypt story were interesting. Same story but very different retellings. But the lessons learned are still very powerful and important. I found the book to be very interesting because I love stories about people like me who face tough times with inward and outward struggles but who never give up and with God's help find what they need to truly be able to say, "I've got this!" I read this book in one short sitting. I'm excited to pass it along to my teenagers. There are quite of a few of their favorite speakers in this book. 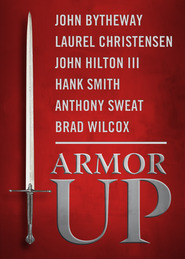 From Hank Smith's gripping retelling of Joseph (I cried) to the humor of Zandra Vranes (I snorted), there is a great collection of stories and wisdom on to look up when life has you down. The stories are short enough to read quickly but written well enough to move the reader. I totally enjoyed every story and thoughts!